Digital advertising is a disaster. Revenue is on the decline, bots are abusing the system, tracking scripts are increasingly aggressive, and users are fed up with invasive ads stealing screen space. Ev Williams, CEO of Medium, called online advertising a “broken system” that doesn’t serve people; it rewards publications for attracting a few seconds of attention. Projects like Oyster are attempting to provide an alternative, but until a viable solution is adopted by a critical mass, the web is left to limp along as is. Brave Software believes it has the right solution. The Basic Attention Token (BAT) and the Brave browser make it easy for consumers to support creators and publishers to monetize their content, all without deploying a single ad. The system is based on human attention, powered by cryptocurrency and Brave’s privacy-centric browsing experience. Advertisers want access to user data to deliver targeted content. Consumers aren’t keen on their every move being tracked. If a free and open web with any semblance of privacy is to be maintained, something has to change. Brave Software’s solution is surprisingly elegant. The initial phase involves two key components: Basic Attention Tokens and the Brave browser. By funding an in-browser wallet with BAT, users can donate funds to their favorite creators, all without sharing private information. Publications stay in business without resorting to paywalls or ad spam, and users enjoy their daily activities while supporting quality content. 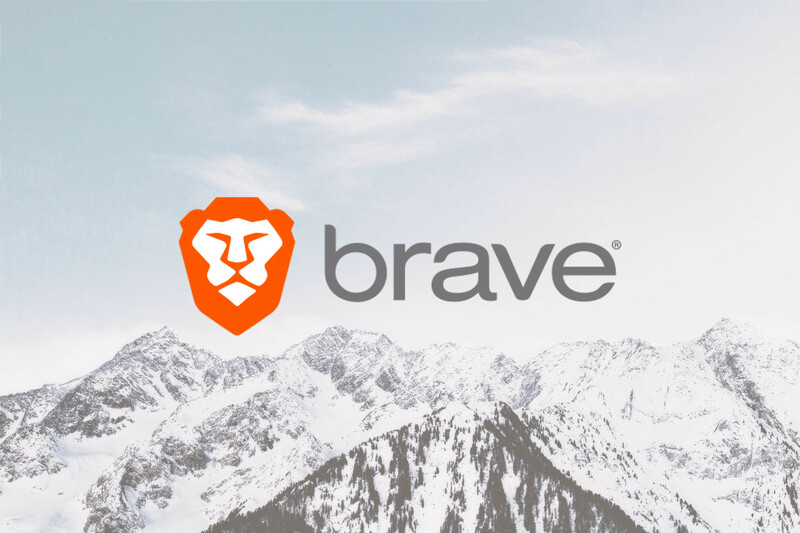 Brave’s second phase aims to complement BAT payments by allowing select advertising agencies to show ads inside the browser. Users have to opt in to see these ads, so the focus on a fast and ad-free experience won’t be affected. The program will help control the quality of advertisements that appear and provide an additional long-term source of revenue for publishers. The BAT roadmap for 2018 includes optimization and scaling for all of Brave’s major features. BAT integration into other apps and support for new publisher onboarding is also in the works. Brave is a free and open-source browser built on a Chromium core. Its core goal is to improve user privacy by sharing less data with websites, blocking ads and malicious tracking scripts by default. It’s an ordinary browser from one point of view, but it has the power to fundamentally change how users and creators interact with each other. Brave’s default security features are one of its biggest sellers. As soon as you install the browser, you’ll be protected from ads, cookies, fingerprinting efforts, malware, phishing attacks, data leaks via unencrypted HTTP connections, and more. All of this is accomplished without the need to install extra extensions. Brave collectively calls these security settings “Shields”. You can increase or decrease the safety measures with ease. Ad block settings also let you choose which filter lists to use, or you can add your own custom filters for improved blocking power. Images from Brave’s “Shield” settings (left) and the site-specific filtering results (right). The default Shield settings will be perfect for most users. They manage to filter ads and privacy-invading scripts without breaking the web. There’s also an attractive tally displayed on blank tabs that shows how many trackers and ads were blocked, how many connections were upgraded to HTTPS, and how much time you saved by not waiting for extraneous content to load. Most experienced users reach for ad blockers and anti-tracking extensions the moment they install a new browser. Brave cuts out that process and presents a friendly, safe alternative for anyone who wants privacy but isn’t as web-savvy. 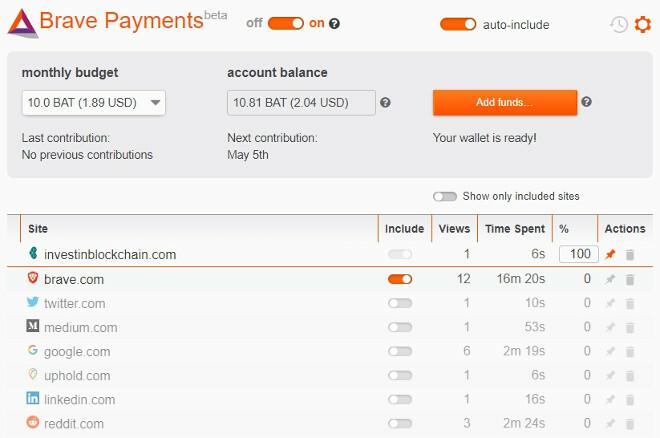 The Basic Attention Token payments system is built into Brave. It’s a no-obligation optional feature you can set up and use to support online content, including web publications, YouTube creators, and Twitch streamers. The first step to using Brave Payments is to fund the wallet. You can use Bitcoin, Ethereum, or Litecoin to fill the balance in a matter of moments. Brave has partnered with digital payments processor Uphold to allow for fiat-based funding, which also functions as a handy withdrawal method for publishers receiving BAT payments. Once a budget is established and a balance is in place, you’re free to use the web as normal. Brave tracks the sites you visit along with views and time spent on each domain. You can view the list at any time and include or remove publishers with a quick click. Screenshot from the Brave browser “Payments” menu. At the end of each month, BAT payments are portioned out to the creators of your choosing. The amounts are roughly equivalent to the attention you gave to each site. If 18% of your online time was spent in one location, that creator gets a bigger cut of your monthly budget. Brave lets you audit and adjust the list before distributing funds, leaving you in full control over where your money goes. Once the payments are sent you can fund your budget for the next month and keep the system going for as long as you like. Brave takes 5% of your publisher donations, a figure that’s higher than most payment processing services, especially for cryptocurrency transactions. The company uses the fee to support the infrastructure and intends to minimize it over time. It’s worth noting that if BAT payments is all you’re interested in, you don’t have to use the Brave browser. A third-party developed (but Brave Software endorsed) extension for Chrome and Firefox called BATify lets you support sites through cryptocurrency microdonations. The process is largely the same as the native payments system—you just need to install an extension to your current browser and set things up from there. Brave is a young and ambitious piece of software. It’s stable, secure, and fast. The built-in privacy protection and microdonation support are both incredibly forward-thinking. As a browser, though, some users will find it falls short in a few areas. One of the most noticeable drawbacks to Brave is its lack of support for extensions. At the time of writing, users are limited to features included with Brave by default. Basic privacy and advertising protection is there, along with a few password managers and Pocket integration, but that’s really it. You can’t visit Chrome’s extensions marketplace and add new content. The Brave team has a method for manually installing extensions if you can’t live without certain features. Brave 1.0 will have better support for Chrome’s extensions marketplace, which will be a massive step forward for the browser. There are iOS and Android versions of Brave’s browser as well, both touting speed and data-saving benefits as a result of the built-in ad blocking. While they’re certainly fast and easy to use, neither supports BAT microdonations or extensions at this time. Using Brave as your everyday browser is as natural as any other browser on the marketplace. The default privacy features are wonderful, BAT payments are simple and non-invasive, and the overall feel is sleek and responsive. Once full support for Chrome extensions is added, Brave ought to be a sturdy competitor to the big browsers. The ultimate point of Brave isn’t simply to block ads and protect online privacy—it’s to facilitate a new way to power the internet. As more effortless BAT payments are sent and received, more users and content creators will see the benefits of a private, ad-free web.